Beth Glover and Preston Sadleir. Photo by Tim Fort. Preston Sadleir and Sarah Stiles. Photo by Hubert Schriebl. In this digital age theater is somewhat of an anachronism, a throwback to a more humanistic time when people went visiting in the evenings and families discussed the day’s events at the dinner table. One has to wonder if that time is gone forever or if the pendulum will swing back so that texting, email, and other electronic communication will become so ordinary that they will fade into the background like any common tool, relinquishing the field to actual human interaction. Fortunately theater is still with us and still commenting on modern society and asking questions that are relevant to our lives as it entertains. 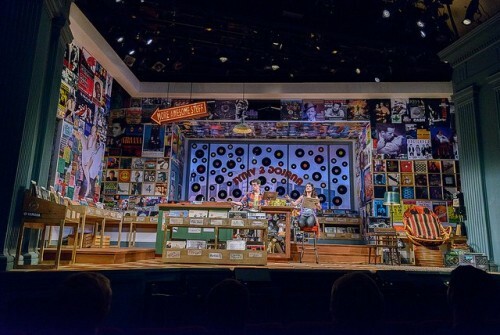 The world premiere of Analog & Vinyl, now running at the Weston Playhouse in Weston, Vermont, is exactly what theater should be—a living example of entertainment, storytelling, and commentary all rolled into one engaging evening. The play has been in development for three years. It will continue to evolve, but at the Weston has now, in its full length, played before a live audience, an audience that was clearly delighted by its youthful energy, memorable tunes, and modern perspective. Harrison, owner of Analog & Vinyl, the failing vintage record shop that is the sole set, is certain that a resurgence of demand for vinyl is just around the corner, if he can only find a way to keep the shop open until then. Most days his only company is Rodeo Girl, his volunteer employee, a proletarian philosopher and exuberant chatterbox, who blithely ignores Harrison’s recurring reminder that she doesn’t work there. While Harrison extolls the virtues of analog and vinyl, where each record is one-of-a kind, Rodeo Girl sings of her blog and Facebook and is uncomplicatedly tickled by what she sends and receives on her smart phone. Harrison longs to make his father proud while Rodeo Girl yearns for to be noticed, to be loved. In walks The Stranger (played with robust cynical humor by Beth Glover) with the devilish offer of a trade, one like that rumored of the legendary bluesman, Robert Johnson, and his reputed midnight dealings with Scratch at a mysterious crossroads. As it becomes clear that The Stranger is able to deliver on her promises, each of these young characters ponders this opportunity to realize their heart’s desire. The outcome is unexpected and before the final curtain, the audience learns that all is not as it has appeared. The music and lyrics are integral to the plot, and much of it very memorable, especially the innocent and touching Anything That Matters and the topical Great Planet. A full orchestra of New York-based musicians back up the performers. The cohesiveness of the cast has to be credited to Director Michael Berresse, who also choreographed the show. 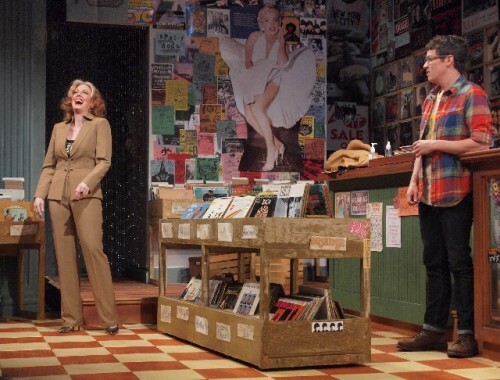 In the three weeks the play was in rehearsals he worked with the actors and writer, as lines were changed, scenes and songs cut, and the show tightened, and yet the flow of action was flawless. The cast is superb. Preston Sadleir gives eccentric Harrison depth and sincerity. Sarah Stiles’ Rodeo Girl is feisty, quirky and thoroughly charming. Beth Glover’s sardonic Stranger has weight without heaviness. The single set and lighting worked beautifully, the record store walls covered with yellowing album covers and movie posters with a brightly lit sign pointing to “More Awesome Stuff” created the crowded idiosyncratic atmosphere of such establishments, as did the background window/scrim peppered with 78s and 45s and the reverse of the letters spelling out the shop’s name, Analog & Vinyl. The window also served as a view of the street, and of the characters as they approached the entrance. 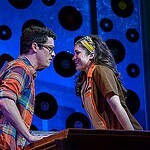 It’s a real treat to see a play that has the language and trappings of today, with our cell phones, iPods, and connection to the internet acknowledged and visible, and even more so because Analog & Vinyl addresses our ambivalence as to the place these electronic distractions have in our lives. It reminds us that it is the individual who is memorable and distinct, and that the individual is truly one-of-a-kind. And all that’s conveyed while we’re just plain having fun.